This is another of my articles from one of my yet to be published books on the Battle of Gettysburg. To Vincent’s right another hero emerged, Colonel Patrick “Paddy” O’Rorke; the young 27 year old Colonel of the 140th New York. O’Rorke was born in County Cavan, Ireland in 1836. His family immigrated to the United States, settling in Rochester, New York during the great wave of Irish immigration between 1838 and 1844. There the young O’Rorke worked hard to overcome the societal prejudices against Irish Catholics. After he completed his secondary education, he worked as a marble cutter before obtaining an appointment to West Point in 1857. He was the only foreign born member of his class at the academy from which he graduated first in his class in 1861. 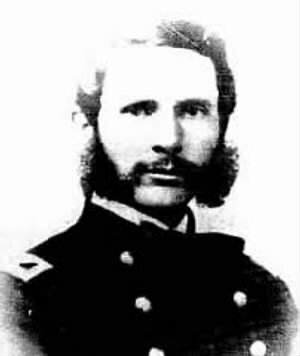 “Aggressive and bold, there was also something that implied gentility and tenderness…Beneath the mettle of a young professional soldier was a romantic heart that could croon a ballad before wielding the sword.”  O’Rorke married his childhood, schoolmate, fellow parishioner and childhood sweetheart, Clarissa Wadsworth Bishop, in the summer of 1862 and shortly thereafter accepted a commission as colonel of the 140th New York Infantry. At Gettysburg, O’Rorke was with Weed’s brigade when Gouverneur Warren found him as he attempted to get any available troops to the summit of Little Round Top. When Warren found O’Rorke, who had been one of his students at West Point, he ordered him to follow him up the hill, saying “Paddy…give me a regiment.”  When O’Rorke said that Weed expected him to be following him, Warren took the responsibility telling O’Rorke “Bring them up on the double quick, and don’t stop for aligning. I’ll take responsibility.” O’Rorke followed with his gallant regiment with the rest of the brigade under Weed following behind them. O’Rorke’s troops smashed into the surging Rebel ranks, stopping the Confederate assault in its tracks and taking over two-hundred prisoners. As O’Rorke “valiantly led his men into battle, surging down the hill toward the shelf of rock so recently vacated by the right wing of the 16th Michigan, he paused for a moment to cheer his men on and wave them forward. When he did, he was struck in the neck by an enemy bullet….O’Rorke, killed instantly slumped to the ground.” But his regiment “had the initiative now. More and more men piled into a sloppy line, firing as fast as they could reload. Their dramatic appearance breathed renewed life into the other Union regiments on the hill, which now picked up their firing rates.”  The gallant young Irish colonel was dead, but he and his regiment had saved Vincent’s right flank. The regiment had suffered fearfully, “with 183 men killed or wounded, but they had managed to throw back the Texans. The adjutant of the 140th estimated that they came within sixty seconds of losing the top of the hill.”  O’Rorke’s soldiers were enraged by the death of their beloved colonel and picked out the Confederate who had killed him. One of the soldiers wrote “that was Johnny’s last shot, for a number of Companies A and G fired instantly.” It was said that this particular Johnny was hit, by actual count, seventeen times.” Now led by company commanders the 140th stayed in the fight and solidified and extended the Federal line in conjunction with the rest of Weed’s brigade to their right. The badly wounded Strong Vincent was taken to a field hospital at the Weikert farm where he lingered for five days before succumbing to his wounds. In the yard lay the body of Paddy O’Rorke whose regiment had saved his brigade’s right flank. Vincent knew that he was dying and he requested that a message be sent to Elizabeth for her to come to Gettysburg. It did not reach her in time. Though he suffered severe pain he bravely tried not to show it. Eventually he became so weak that he could no longer speak. “On July 7, a telegram from President Lincoln, commissioning Vincent a brigadier general, was read to him, but he could not acknowledge whether he understood that the president had promoted him for bravery in the line of duty.”  He died later that day and his body was transported home to Erie for burial. Ten weeks after his death his wife gave birth to a baby girl. The baby would not live a year and was buried next to him. “The colonel commanding hereby announces to the brigade the death of Brig. Gen. Strong Vincent. He died near Gettysburg, Pa., July 7, 1863, from the effects of a wound received on the 2d instant, and within sight of that field which his bravery had so greatly assisted to win. A day hallowed with all the glory of success is thus sombered by the sorrow of our loss. Wreaths of victory give way to chaplets of mourning, hearts exultant to feelings of grief. A soldier, a scholar, a friend, has fallen. For his country, struggling for its life, he willingly gave his own. Grateful for his services, the State which proudly claims him as her own will give him an honored grave and a costly monument, but he ever will remain buried in our hearts, and our love for his memory will outlast the stone which shall bear the inscription of his bravery, his virtues, and his patriotism. Rice would be killed during the Battle of the Wilderness just ten months later. Vincent’s wife Elizabeth never married again and was taken in by the Vincent family. Vincent’s younger brother became an Episcopal Priest and Bishop and later provided a home for her. She became a tireless worker in the church working with charitable work for young women and children. This led to an interest in sacred art and she wrote two books: Mary, the Mother of Jesus and The Madonna in Legend and in Art. She also translated Delitzch’s Behold the Man and A Day in Capernaum from the German. Elizabeth Vincent passed away in April 1914 and was buried beside her husband and daughter. He recovered from the wound, and was promoted to Major General commanding a division and awarded the Medal of Honor. He received the surrender of John Gordon’s division of the Army of Northern Virginia at Appomattox on April 9th 1865. When he did he ordered his men to present arms in honor of their defeated foe as those haggard soldiers passed his division. It was an act that helped spur a spirit of reconciliation in many of his former Confederate opponents.